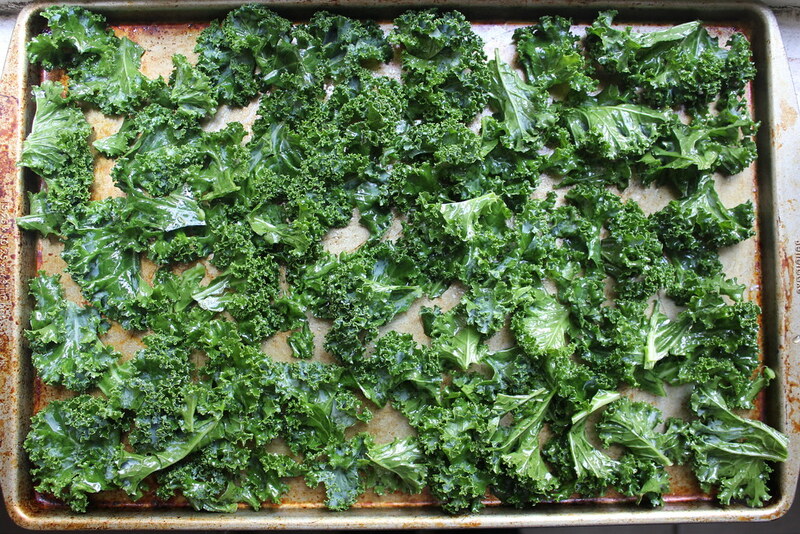 Kale is the new salad green. A couple decades ago, choosy eaters eschewed iceberg for the more nutritionally dense, greener, leafier types of lettuce like romaine. Then, they went onto fluffier, miniature, mixed ones often including — or solely consisting of — baby arugula (RIP AKA “rocket”). Their spicy kick lent complexity to sides, and they’re also very nutritionally dense, much more so than romaine. Baby spinach greens, too, played a role in this evolution, beckoning the health-conscious for its superfood benefits. Now, the “it” raw salad fodder may have delved even deeper into healthy realms with a once under-sung brassica, typically tougher and prepared braised: kale. I remember when my parents first started buying romaine lettuce instead of iceberg; they remarked how it was a funny way of starkly dividing the crispness and green found in more bulbous heads (they of course bought it anyway, swayed by the health benefits). I don’t think my parents would recognize kale as something you could eat raw, but in the last decade or so, many have. Fresh kale leaves taste great with a simple lemony vinaigrette, or with a pungent anchovy-based Caesar dressing. They’re great when shredded or torn and “massaged” with olive oil, moisturizing and deepening the color of the leaves. I love working with raw kale when it’s extra-fresh and crisp. Stripping the leaves from its thick stalk is such a satisfying chore. I love the way it crunches in your hands as you rub it with oil and salt. And it has a grassy, sweet taste when raw. But I also love robust-tasting kale leaves when they’re roasted. This process dehydrates them, creating a chip-like crispness and concentrating their flavor, while adding to it toasty qualities. They almost resemble crackly nori sheets to me, which are roasted seaweed. 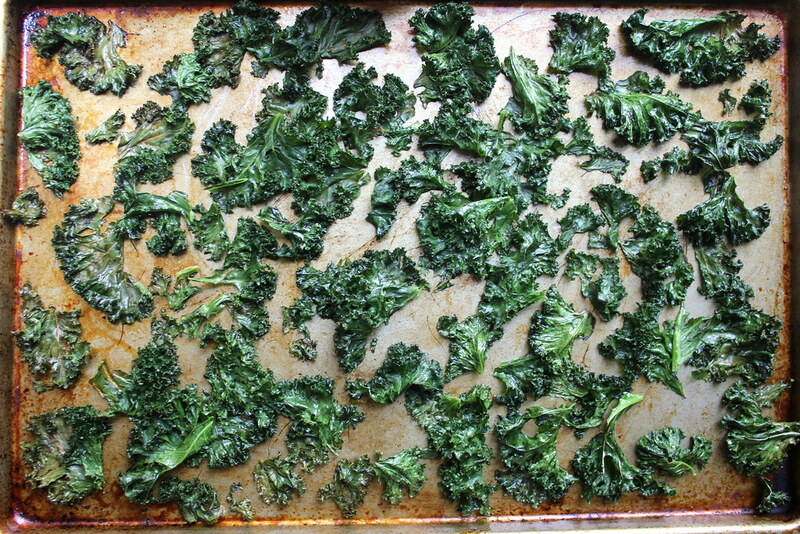 Roasted kale is great for crumbling into bits to sprinkle on things, much like nori. So I decided to roast some kale for a simple chickpea salad. Because I had a huge bunch of kale on my hands, I finely chopped the remaining raw leaves that wouldn’t fit on the baking sheet. These would make up for some finely chopped fresh herbs, I figured. 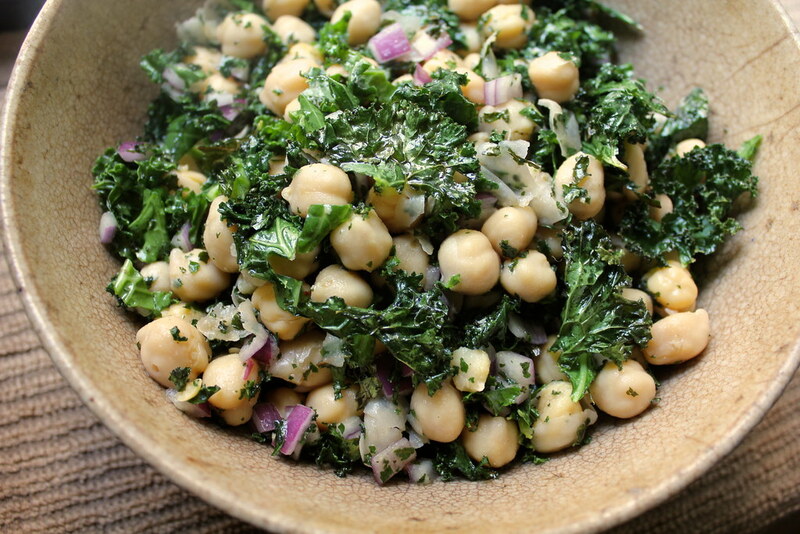 It’s really a chickpea salad with kale two ways: roasted and raw. The best of both worlds. You can’t see it, but a major player in this salad is fresh lemon juice. Lots of it. Good olive oil that you love to dunk bread in is another key. I know they say that chilled bean salads like this taste better the longer they sit, but I kind of think they need another hit of both lemon juice and olive oil once they’re taken out of the refrigerator to eat again. The chickpeas tend to absorb these liquids like sponges and need another spritz. In summer, we’d be able to add grape tomatoes for extra color, but for now, red onion or shallot chopped finely makes a crisp complement. It’s a picnic-worthy side dish that works great as a complete lunch. Preheat oven to 400 degrees. Strip the thick stems from the kale leaves by holding it by the base and squeezing your other hand around the stem as you tear away from the base. Reserve two of the stripped leaves and set aside. Tear the remaining kale into pieces of equal size, no larger than about 2″. 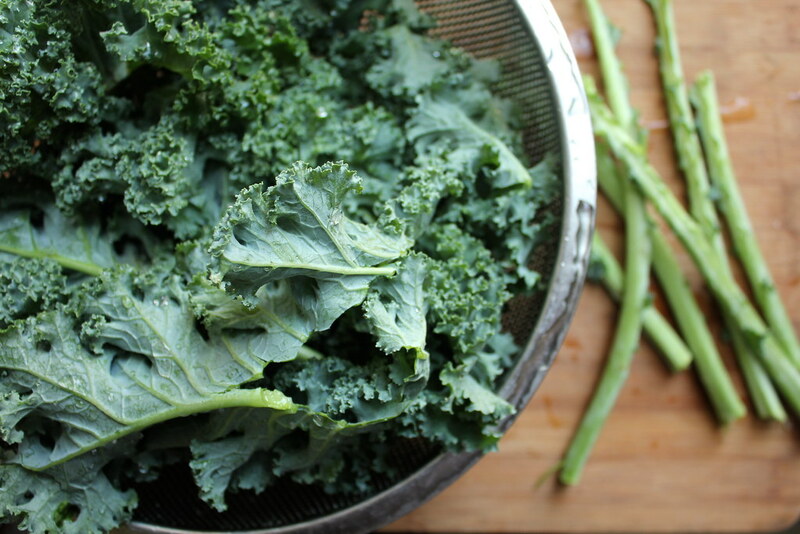 Rub the torn kale with 1 tablespoon of the olive oil and a pinch of salt and pepper. Spread evenly on a baking sheet, ensuring that no leaves are stacked on top of one another. Roast for 5 minutes before checking on it. If the pieces are just starting to brown slightly at the edges, remove from oven and let cool. If not, roast for another 1-2 minutes before checking again. Finely chop the remaining fresh kale leaves. 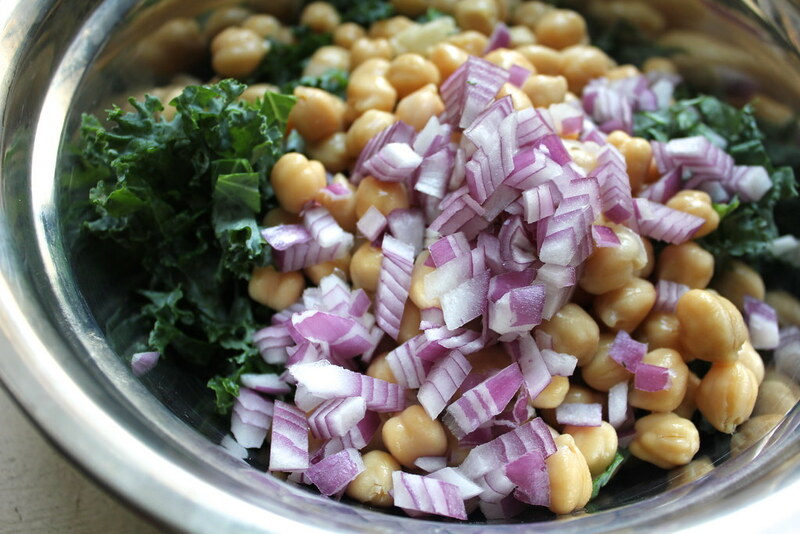 Combine in a large bowl with the chickpeas and chopped onion or shallot. Add the lemon juice and remaining olive oil and season with salt and pepper to taste. Stir in the roasted kale pieces, crumbling them a bit with a large spoon as you stir. Serve immediately or keep covered and chilled up for 4 days. Two brownie points: It’s a struggle to think of something bad to say about this one. On the pros, there’s plenty of kale, a rich source of Vitamin K, Vitamin C, Vitamin A, calcium, potassium, iron and so much more. There’s chickpeas, a legume that provides protein while helping lower your cholesterol. There’s extra Vitamin C from the fresh lemon juice and heart-healthy olive oil as fats. I guess I went and used canned chickpeas for time’s sake, which are loaded with sodium and not preferred over soaking and cooking whole, dried chickpeas. Six maple leaves: Organic kale from California takes a long haul across the country when it’s not in season in the Northeast. But at least it stays crisp on shelves longer than baby greens that so many salads have, requiring less energy to keep them bouncy and fresh. This recipe is still relatively great for the body as well as the earth, totally plant-based while being rich in protein and well-rounded for a meal. Oh this sounds wonderful! I love, love, love chickpeas and kale together, and usually saute them both in olive oil with spanish paprika. Can’t wait to try this combo for summer picnics in the park. Thanks for sharing, and as always, love the cost breakdowns! @Jenn thanks! Hope you do enjoy it soon and love the saute idea with paprika! You have shared some nice information in this post. Thanks for sharing such valuable post. This salads seems yummy! I will try out this recipe. I had a really tasty kale and almond salad just yesterday.When you have a chance check out my website http://www.scotchbonnetgrill.com. You might want to try our food. I was recently diagnosed with hypertension and am seriously looking into adopting a healthier lifestyle. I’ve come to really enjoy kale, mainly cooked but after seeing how easy this one is, I’ll definitely be trying it soon. Thanks! Made this salad for my family last night. NOT a group of kale lovers (except for me) and they ATE IT UP!!! (Pardon all the shouting, but I am so excited to find a delicious salad with kale that everyone LIKES!!) Thanks! Now, how do I share this on facebook? I am in a recipe group and want to put a link to this recipe to share it, but can’t figure out how?